A very private hostel/hotel in a quiet residential area of Malaga. Walk to centre in 10 minutes or take bus. I appreciated the quietness and my private room. I would definitely stay there again. Very nice vila in the quiet street, close to the centre, nice rooms with romantic atmosphere, nice staff. The only problem for me was that the staff locks (maybe for the safety reasons) the kitchen at 10 p.m. until the late morning, thus, if you want to take your cold drink from the refregerator at this time - forget about it. We stayed 5 nights, in room 14. Room really clean, en-suite, room cleaned daily and fresh towels. In the room we had fridge, tv, aircon, fan, multi plug extension adaptors, shampoo/conditioner supplied, big wardrobe with plenty hangers. Staff all very friendly, Afaf was great. We arrived very late, and we were left keys and instructions to our room. Reception sells pop, water, beer, snacks all cheap (wine £6 btl). We had a great time, and cant recommend this hostel enough, thanks again. Great place near the city center, the only thing we didnt like is the fact that the water is coming out the shower and it floodes the bathroom. Otherwise, everything is great. This is a guesthouse - not a hostel, and it's a perfect place for guests who wants to be served a breakfast in the morning. The kitchen opens 9 AM, which I think is too late. Villa Alicia is idyllic and located in a suburban area. 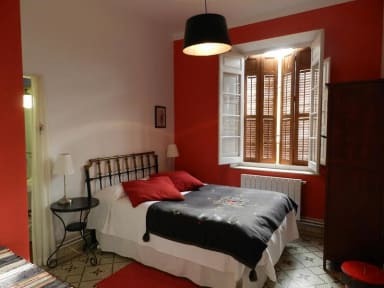 Walking distance to the center, and very good bus connection to/from the train station, Maria Zambrano. From there it's a 10 minute ride to the Airport. A very nice and satisfactory hostel with good service from the personnel who helped us a lot with tips and recommendations on places to visit on day and nightime. The room was big enough with good beds and heating, and the bathroom was very good too. Nice building in quiet area. The staff spoke very little or no English but they called the manager when I had a question. In the four days I stayed there they did not clean my room and I had to ask them to take out the garbage from my room which they happily did. Nice that they had a kitchen and fridge which the guests could use. The wifi worked on and off. Room was spacious, bed was big. Though didn't like the smell of smoke/smoking when I arrived to the room. Breakfast (additional €4charge) times were late, starting at 9am [but learnt/ believe this is common is Spain?] I had to leave by 8.30am so missed breakfast. Lovely terrace space with big wooden chairs and big comfy seat cushions to sit and chill. Such an awful management for a beautiful place. They treated us badly in a very unfair way for no reason. First morning we woke up the breakfast was finished, because the bread was over. The cleaning of the room was poor, with dirty floors. The kitchen space was managed so badly, the woman in charge was owning the place too much and even becoming aggressive. The house lacks completely of a common space atmosphere, the rooms and doors were closed all over super early. NOT WORTH THE PRICE.